It was a real pleasure to attend The Institute of Customer Service Annual Conference last week. Thanks to the ICS for hosting such a vibrant, stimulating event. 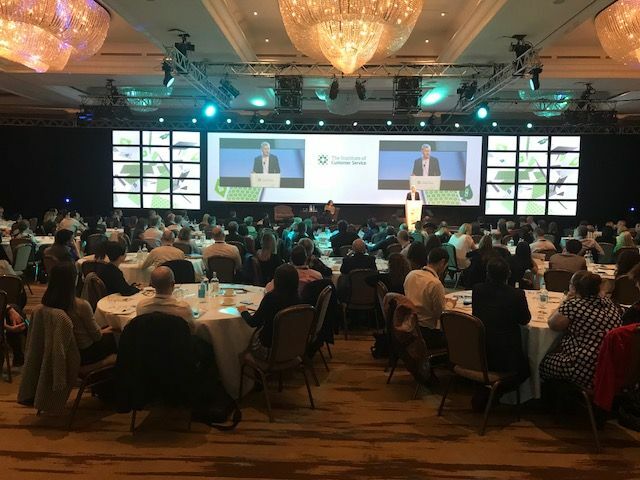 The theme of the Conference – Customer Service 2018: Game changing strategies in an unpredictable environment – was set out by Jo Coulson, CEO in her opening address. Many of the speakers who addressed the 400+ people attending the event highlighted Jo’s messages. If you were unable to go, or missed some of the speakers, we thought it would be helpful to share some of the key themes and takeaways from the sessions that we joined. These included Joe Gordon, Head of first direct, Mark Thomson, Director General at HM Passport Office, Alison Jones, Director of Volkswagen UK and Matt Rogan, Chairman of sports marketing agency Two Circles. ICS research has demonstrated this relationship over many years and Joe Gordon highlighted that first direct has been in profit since 1994. The bank also has the highest net promoter score in the retail banking sector. Joe argued strongly that putting customers at the heart of your business is a key strategy for business success. The best experience on offer is setting customer expectations, regardless of sector. And this ‘new normal’ is raising the bar for all organisations. Companies that truly listen to their customers will win out. This customer focus is part of the strategy at HM Passport Office, which has put complaints data at the heart of the organisation as a way of staying close to these changing expectations. Several speakers highlighted how valuing and investing in employees was a key contributor to getting customer experience right. And in turn leading to business success. Recruiting for values and training for skills is increasingly common practice among the most forward-thinking businesses. Human creativity is perhaps more critical than ever as businesses become more data-led and digitally delivered. It’s important to keep interactions ‘human’, even when they are not with a real person. Agility is important for both organisations and individuals and forward-thinking companies are change-ready and open to new ways of working. This was another key theme from the day. For example, Volkswagen UK expects their organisational structure will require review and likely change every 18 months. The company is using cross-functional project teams and agile working methods, borrowed from the technology sector, as a way of keeping pace with the speed of change. This was echoed by Matt Rogan, Chairman of sports marketing agency Two Circles, who advocated an approach whereby you accept that your products are always in beta testing. Others talked about getting things 80% right and working constantly to refine and improve them with your customers. Although this wasn’t really talked about during the sessions we sat in on, here’s a final observation from us. In any unpredictable environment the original role of brands as symbols of trust and helpful navigators of choice is again very relevant. Customers are looking for organisations that behave in ways that align with their values. Brands will be judged on what they do, not what they say. The NatWest strapline ‘We are what we do’ really captures an understanding of what people are looking for today. All in all, it was a stimulating, worthwhile event. Good speakers, some great conversations with delegates and some new contacts that we hope to be working with during the coming year. We will definitely be back in 2019. If you would like to know more about how cp2experience, a customer experience consulting and training company, can help you shape your organisations CX strategy, please contact us today.